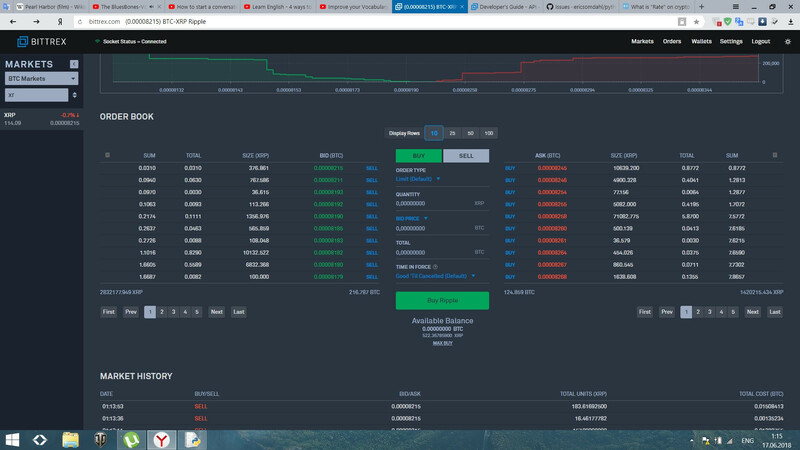 I use bittrex api and python for trading. I am interesting about lowest Ask and highest Bid prices on the pair. What RATE I would pass? 1.0, or 1.1 or different? And what for lower prices? What is this number exactly mean? The rate (of exchange) is just the price for your order. According to their documentation, when you create a buy or sell order, you need to specify the market, the quantity, and the rate. The market specifies the currency pair. For example the market BTC-XRP specifies BTC as the "quote currency" and XRP as the "base currency". The quantity specifies how much of the base currency you want to exchange. The rate specifies the quote price at which you want to exchange. Not the answer you're looking for? Browse other questions tagged python bittrex or ask your own question.